Pictured is Andrew Kauffman and Tom Schcwabb. 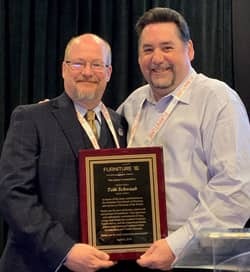 Furniture First buying group announced that it recently held it's annual business meeting and introduced three new board members, as well as the new executive committee of the board. Based on recent strategic planning sessions, two seats were added to the board for more committee involvement and engagement. Tom Schwaab of Howell Furniture in Beaumont, TX was recognized for his service as Chairman of the board during the meeting. Chris Cooley of Michael Alan Home Furnishings in Lake Havasu, AZ is the Chairman of the board. Completing the executive committee are Eric Sinclair of Montgomery’s Furniture, Madison, SD as Vice Chairman, Todd Lehman of INTERIORS HOME, Lancaster, PA as Secretary, and Pat Callan of Callan Furniture, Waite Park, MN as Treasurer. Retailer Art Scholet, Scholet Furniture in Oneonta, New York, retired from the board of directors after ten years of service. He was recognized for his contributions to the board at the group’s twenty-fifth anniversary gala held the previous Saturday. About Furniture First: Furniture First is a cooperative national home furnishings and mattress buying group serving full line independent retailers with sales over $2 million. A recent analysis found that collectively the group sells $2.5 billion at retail with their approved merchandise programs in the 501-member storefronts. Furniture First occupies showrooms in High Point (IHFC G-770) and Las Vegas (B530) where they display products from several of the group’s approved vendors. For more information, visit www.FurnitureFirst.coop/join or call 800-411-3477.